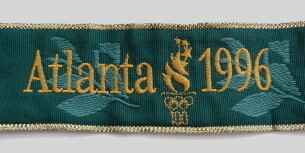 Atlanta Games emblem and (different) sport pictogram. 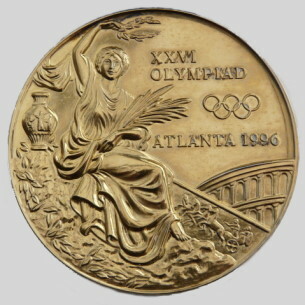 Preparations for the design and production of cicory and commemorative medals began in April 1994. The designer of the 1996 pictograms was awarded the contract to refine the design for the victory medals and design the commemorative medals. 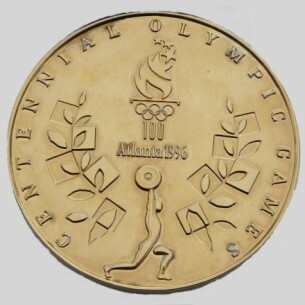 The obverse of the medals adopted the design used since the 1928 Amsterdam Games. The design depicts the goddess of victory, Nike, holding a bundle of palm leaves in her left arm. Her right hand holds a wreath of olive leaves above her head. Behind her stands the ancient Coliseum with a horse-drawn chariot. An amphora is also included in the design. 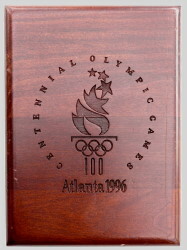 The reverse of the medal displays the 1996 Games logo and the sport pictograms signifying the event won by the athlete. 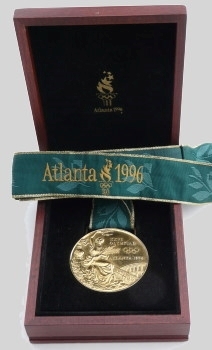 Each medal was also engraved with the name of the event in which it was won, signifying the first time medals contained sport-specific designs.